‘How-to’ Awesome Neckerchief Slide Designs — Scurry Tails Style! As a general rule, boys like knives and boys like to carve and whittle with those knives. Most of the time, what they end up with after a few hours of carving around a camp fire is a sharp, de-barked stick — really only good for hurting themselves or another boy. Scouts (and all youths — boys and girls alike) can put their developing knife skills to work on something a bit more productive and useful, by carving for themselves a nifty neckerchief slide, like the one pictured above that my favorite Webelos II made for himself with some scrap wood and about 2 hours of a Saturday. Note that both pattern templates look “muddy” when viewed in our Firefox browser, but appear fine in Explorer and Chrome; our apologies for any difficulty with this. 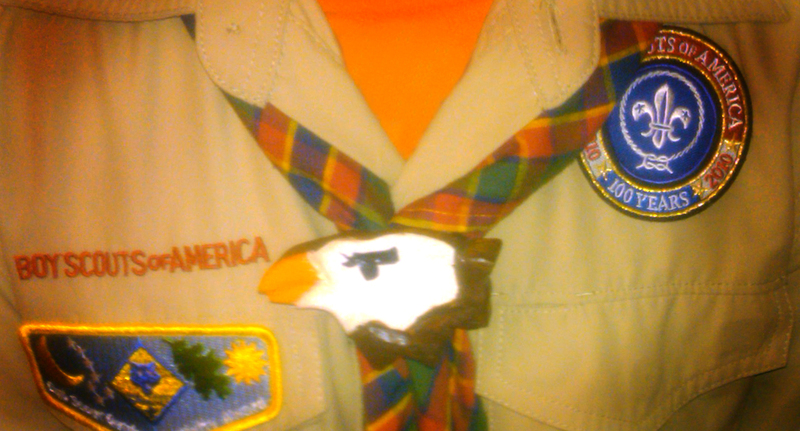 Got a cool picture of your own neckerchief slide to share? Let us know how we can see it and we’ll check it out — we might even feature it in a follow-up post! ~ by Random Handyman on October 2, 2012.